So I am not a huge fish cook and actually when I bought Salmon (at my hubby's request) I had no idea how to buy it, cook it, or season it. Thankfully my wonderful sisterinlaw Holly and motherinlaw Rena came to the rescue. Holly and I bought the salmon from Costco and luckily were able to get two meals out of the salmon we bought. Rena then helped me season it. 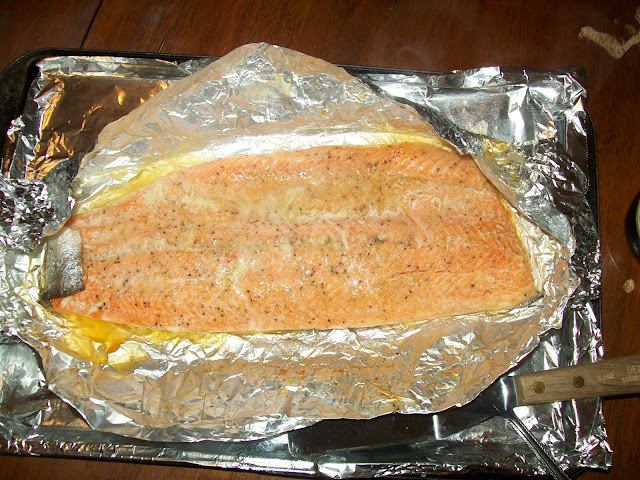 We put the raw salmon (skin side down) on aluminum foil that had already been sprayed with cooking spray. We then generously sprinkled the fish with Lemon peel, Lemon and Pepper, and added four slabs of butter onto the fish. Then we wrapped it up in the aluminum foil, labeled it, and tossed it into the freezer. This was so simple. When Sunday morning came around I pulled the fish out of the freezer and then let it thaw in the fridge. When I took it out at 4:30 pm the Salmon was still halfway frozen, so I unwrapped the Salmon and placed it on a baking sheet. It was nice that everything was already done. I cooked it for 20 minutes at 350' and then checked it. It was still pretty pink, so we put it in for another 20 minutes. It came out perfectly flaky and yummy. I served it with steamed carrots and rice. Everyone loved it and no leftovers remained. Thank you Rena and Holly for helping me with my anniversary feast! WOWWWW I was always aware of how wasteful we are, but I never realized that the reason why we can't save any money is because we spend so much more than what we need. Thank you Danielle for sharing all your great ways to save money.